In a large soup pot, soften the onions, garlic and ginger at a low temperature using a bit of water and put a lid on the pot letting them sweat and release their yumminess to the broth to come. Add the mushrooms and continue to cook at a low temperature, adding a cup of water after a few minutes. While this is cooking, fry the tofu in sesame oil until brown. Turning it often so it doesn’t stick and frying evenly on all sides. When mushrooms are soft add 3-4 cups of water to the pot and add the bouillon cubes & coriander seeds. Any bouillon flavour will do as long as it’s vegan & preferably organic so it doesn’t have any nasty chemicals in it. A few minutes before serving add the coconut milk, tofu, kale, soy sauce & lime juice to the pot. Reduce the temperature and serve when the kale is soft – takes a minute or so. You can use bok choy if you don’t have kale. Garnish with bean sprouts and fresh cilantro just before serving. Hot sauce is an option too. 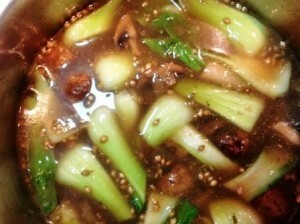 This entry was posted in Recipes and tagged mushroom, Recipe, Soup, Sugar Ridge, Vegan.